You are here: Home / Uncategorized / Can you see through our X rays? Can you see through our X rays? 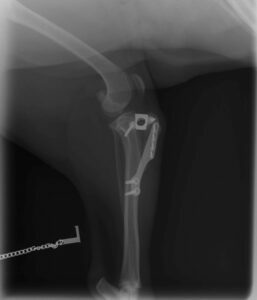 Like most veterinary clinics, we offer X rays for our patients. They allow us to see ‘inside’ our patients to help us diagnose and treat them. As you might expect, there are numerous laws and regulations regarding their use. Firstly, we have to have a Radiation Protection Advisor (RPA). This is an independent, qualified and regulated person who oversees our whole setup and who we can go to for advice. Inside the practice we have Radiation Protection Supervisor (RPS) – in our case it is Michael – who is responsible for the day to day use of our machine. Radiation is a bit like sunbathing, the more you absorb the greater the risk of harm.. Everyone absorbs radiation every day. This ‘background radiation’ is in rocks (granite has a relatively high amount), buildings, food (1.5% of the potassium in a banana is radioactive! ), medical sources (scans and X rays) and cosmic radiation. These levels are very small. For our X ray machine we have to follow the As Low As Reasonably Practicable (ALARP) guideline. The biggest risk to staff isn’t directly from the X ray beam, but as it passes through the patient, some of it is ‘scattered’ around the room and this is where most of any dose we might pick up comes from. Time – shortest exposures and as few as possible. Digital X rays and careful set up helps this too. Digital X rays allow us to modify the image after we have taken it (within limits) thus avoiding possibly having to take another exposure. 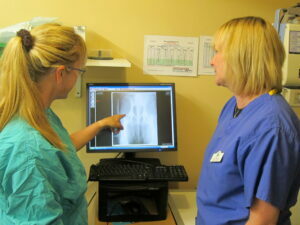 Digital X rays also allow us to e mail them to get expert analysis if required. Distance – the further away the lower the dose. We have to have a ‘Controlled Area’ around our machine which we restrict access to when radiographs are being taken. Shielding – lead screens and aprons etc Our apron has to be tested every year and properly stored and maintained. Digital X rays allow us to analyse and share. We have to train and supervise our staff, provide safe practices, provide risk assessments and Health and Safety training and keep updating and re-inforcing all of it. We have to have contingency plans in case of any accidents or equipment problems. 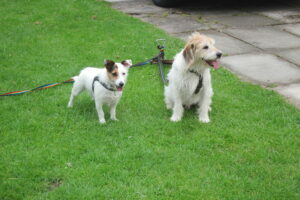 Unlike in people who will stand in the appropriate position, our patients do not so we use sedation or anaesthesia. 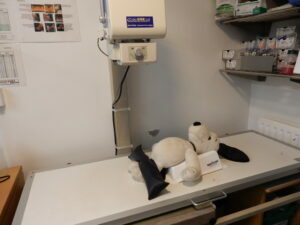 It is forbidden for anyone to hold a pet whilst it is being X rayed, even with lead gloves on. We have a selection of sandbags, troughs and ropes to position our patients. We have to monitor the exposure our staff get by using the little dose meters you may see on our uniforms. Staff have to wear these at work but not take them home! We also have to monitor the general radiation around our X ray room. and keep records. There is also a requirement for us to record and log every exposure we take. Like so much in life, there is a lot of regulation involved but it benefits patients and staff alike. https://www.withygrovevets.co.uk/wp-content/uploads/2018/02/IMG_7033.jpg 2432 3648 Michael Clarke https://www.withygrovevets.co.uk/wp-content/uploads/2019/04/Withy-Grove-logo2.png Michael Clarke2018-02-17 18:29:422018-05-15 15:55:44Can you see through our X rays?